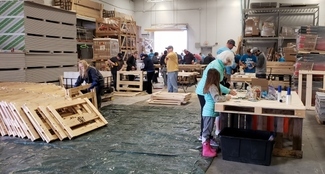 Our April 26-27th build day has been designated for area flood relief and made possible, in part, through a gracious donation by South Creek Wedding & Events in Blair. All of our builds are family friendly. We recommend that children be atleast 8 years old, any child under the age of 12 must be accompanied by an adult. There are three shifts to choose from, feel free to sign up for as many as you like. Building will take place at the 147th and Maple Lowe's store. Lowe's has been a intricate partner in our efforts by providing a work space and supplies. We will be building both inside and outside so please dress in layers. We suggest light weight work gloves, if you have them, to protect from splinters. Safety glasses, ear plugs and dust mask are provided if needed. Since October 2018 we have been able to provide beds to 185 kids, thanks to the dedication of our wonderful volunteers and sponsors. We currently have about 175 on our waiting list. We are looking forward to 2019 and ensuring that "No kid sleeps on the floor in our town!" We will have a bedding drive during the build. Please bring along any new pillows and twin sized bedding sets (comforters and sheets). We will also be scheduling delivery days for these beds, first one being on May 4th. -Please stay posted for even more volunteer opportunities. Calling all sanders! Please sign up each individual separate. Please sign up each individual separate. Hobby wood worker, capable of doing any task for these beds, have already done a delivery/install day so I’m very familiar with them. Please sign up each individual separate. Indicate if you have a truck or trailer to help move bed frames to storage facility. Please sign up each individual separate. Indicate if you have a truck or trailer to help facilitate delivery.